Say it three times fast. 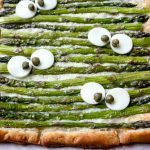 Monster Eye Asparagus Gruyere Tart! :) So I’m all about the sugar (I mean, all 3 of my cookbooks are dessert focused) but everyyy once in a long while, I allow a savory recipe to slip through the cracks. Enter this cute Halloween idea! It’s simple to make, oh so delicious, and perfect for a Halloween party. It might even encourage the kids to eat a green vegetable! Haha! It sure made my husband laugh when I served it up for dinner. Thankfully, baby Blakely took a nap long enough for me to snap a few shots…woo-hoo! 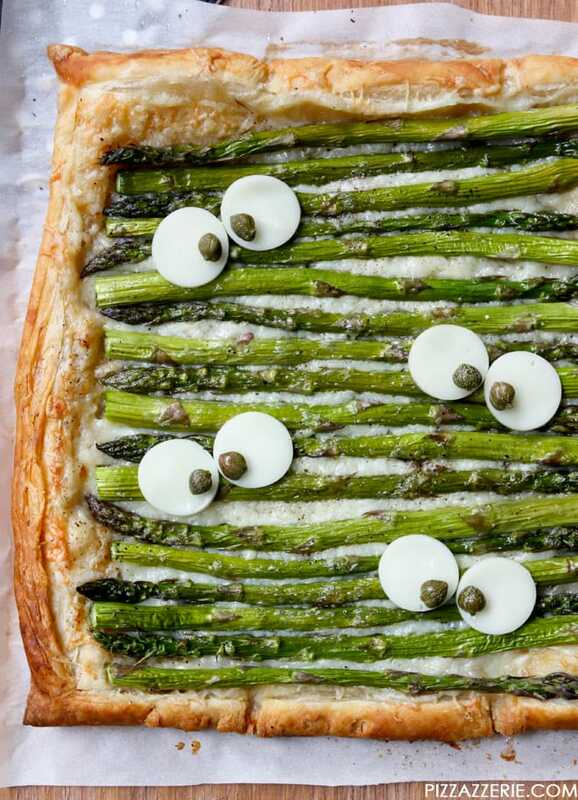 One of my favorite entertaining recipes is this asparagus gruyere tart. I first made it with my brother in Baton Rouge, LA when I went to visit him while he was in graduate school. One bite, and I was hooked. I’ve been making it for years for everything from an easy weeknight meal to a fancy dinner party. It fits the bill for all occasions. I decided it needed a Halloween twist and got the “lightbulb” idea to add monster eyes! When my daughter (who just turned 6 months – yay) finally went down for a nap, I brought my idea to life and snapped some pictures. The monster eyes are actually just provolone cheese and capers. I used the back end of one of my frosting tips to create the small circle,s but you could use any small cookie cutter or even a knife to carefully cut out a small circle. Add the capers on and voila! It truly couldn’t be easier. I also think this idea would be delicious and cute on a pizza too. I think I’ll try that out soon! Capers, if you aren’t sure, are actually pickled flower buds that pretty much just taste “salty” to me, which pairs well with the tart. You could also use black olives. 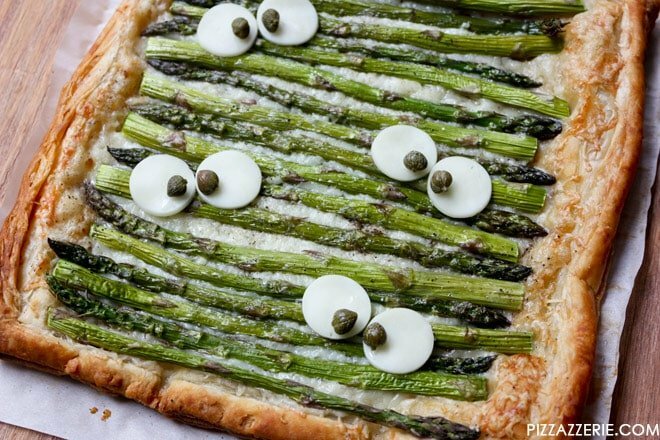 This Monster Eye Asparagus Gruyere Tart is the perfect Halloween dish to serve at parties or just a weeknight family dinner! Preheat oven to 400 degrees F. Spread out thawed puff pastry sheet on parchment paper on a baking sheet. Use a knife to score the pastry (about 1 inch in from the edge). Use a fork to pierce the inside rectangle roughly ever half inch. Remove from oven and sprinkle with gruyere cheese. Alternate stalks back and forth across the tart. Spray or brush with olive oil and season with salt and pepper. Use a small round cutter (I used the back of a piping tip) to cut out 8 small rounds from the provolone slices. Allow to cool slightly. Place rounds in pairs on the tart. Top with capers as "eyeballs". Base Asparagus Gruyere Tart recipe adapted from Martha Stewart. I hope you’ll try out this easy and simple idea or share it with a friend. If you’re looking for more Halloween ideas, check out my Halloween Spider Web Cupcakes, Spooky Skull Cocktail, and FREE Halloween Printable Collection! 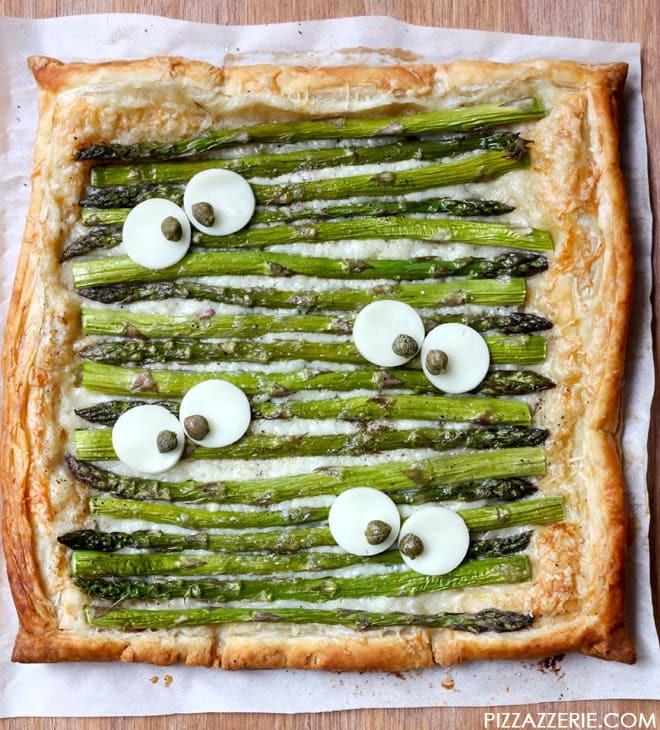 I love this, and it looks absolutely scrumptious- I normally love wrapping my asparagus in phyllo layered with butter, Parmesan and pepper! Hi Jamie! That sounds delicious too! Thanks for the sweet comment! Provolone cheese and capers?!! I love this for a Halloween party!! or even not, just to eat!! looks delicious!! Your creativity is amazing!! Provolone cheese and capers…delicious. That’s one mummy that I wouldn’t mind coming my way for Halloween this year…haha! This is the cutest tart for Halloween! Love this idea! You know I never see savory Halloween dishes… I mean I see SOME but most of the Halloween foods are desserts and sweet treats! I love finding savory options! love! I’m making this for a teacher lunch at my daughter’s school. Is it supposed to be served warm or allowed to cool? Does it need to be refrigerated? I’m planning on making it tonight and bringing it tomorrow. Hi Liz! Sorry that I’m just seeing this comment. It can be served warm or room temperature! I usually keep it refrigerated.